I had some leftover boiled kabuli channa after making Chole and I was in no mood to eat Chole the next day as well. Suddenly the idea of making hummus struck me. When I searched for the recipe I found that to make hummus you require tahini. I didn't have tahini instead I added some sesame seeds. My silly experiment became sucessful and my hubby liked it a lot. Blend 1 cup of boiled chickpeas with 1 tbsp of sesame seeds, little paprika, salt, 1 clove of garlic and some lemon juice. Add little water if needed. Serve as a dip with nachos or chips. Note: The original recipe has Olive oil also. As I did not have it I haven't added it. 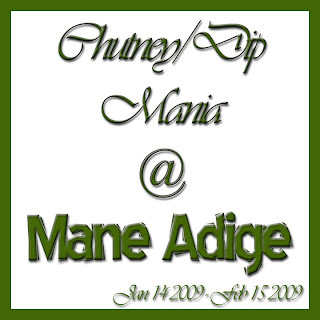 Send it to Ramya's Chuney/dip Mania. looks delicious!! thanx for sending it across to the chutney/dip mania! Hummus is a classic recipe for chickpeas. Thanks for sending this in to JFI Chickpeas!